Opened on 27 May 1937 and was the longest suspension bridge span in the world at the time. This remained until Verrazano Narrows bridge was built in New York in 1964, Golden Gate bridge is now the seventh longest main span and one of the most amazing bridge in the world. Construction of the 8,981 feet or 2,737 m bridge commenced on January 5, 1933. The projected cost was $35 million, however it was completed at $1.3 million (in 1937) below the projected cost. The Golden Gate bridge weighs a massive 887,000 tons and has more than 40 million vehicle crossings a year. The bridge is also the most popular place to commit suicide in the United States. This is a 16.4km amazing long bridge constructed in 1995 by the Danish and Swedish governments to establish a fixed line across the Oresund. The amazing bridge was opened in 2000. Oresund bridge is the longest and amazing bridge combined with road and rail bridge in Europe. Also known as the President JK Bridge, Juscelino Kubitschek bridge was inaugurated on 15th December 2002. It was constructed from 2000 to 2002 at a cost of US$56.8 million. 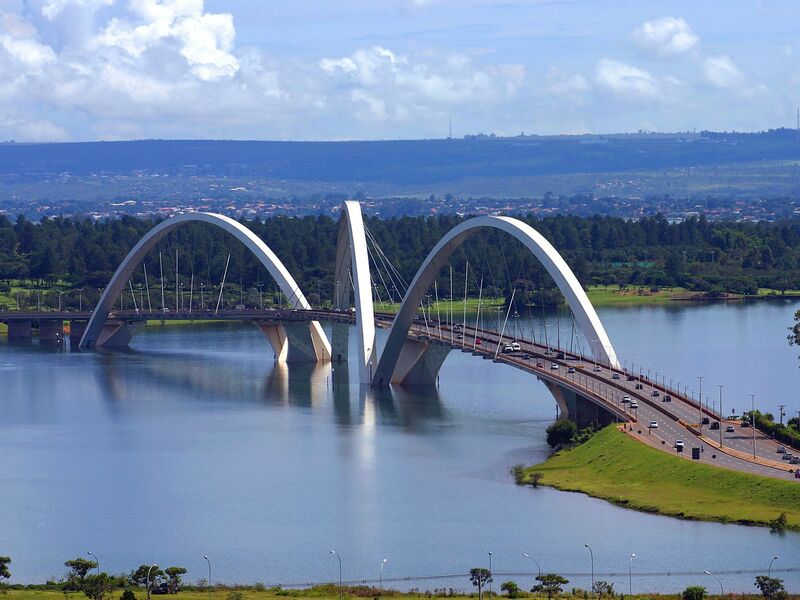 The Juscelino Kubitschek bridge is a 1200 metre ( 3,937 ft) long arch bridge with a 240 metre (787 ft) long arch span. This amazing bridge won the 2003 ABCEM award for the best steel structure of the year. With a length of 3910 metres( 12,827 ft) and a central span length of 1,991 metres (6,532 ft), Akashi-Kaikyo Bridge( also known as the Pearl Bridge) has the longest central span of any bridge in the world. Akashi-Kaikyo Bridge was constructed in 1988 after a disaster in 1955, where the Shiun Maru ferry( carrying children) sank in the Seto Inland Sea after colliding with another Japanese National Railways (JNR) ferry, killing 100 students and a total of 168 people. 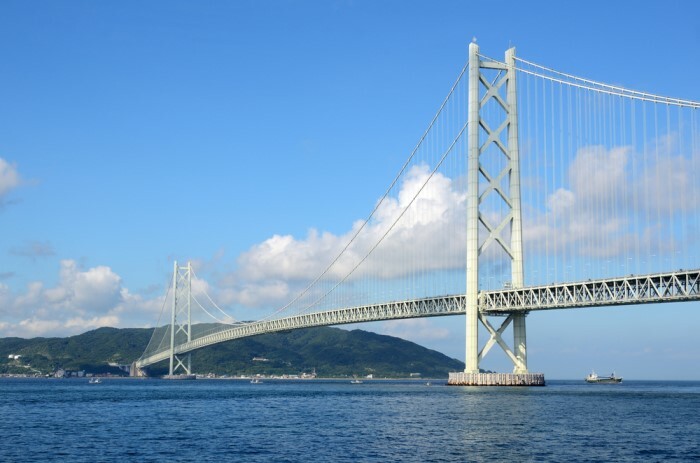 The bridge was completed in 1998 at a cost of ¥500 billion. This amazing bridge is often said to have stretched the limits of suspension bridge engineering. The amazing 25 de Abril Bridge (25th of April Bridge) also known as Ponte 25 de Abril Bridge is a 2,277 metre suspension bridge connecting the city of Lisbon, capital of Portugal, to the municipality of Almada. The bridge is the 20th largest and amazing suspension bridge in the world. The 25 de Abril Bridge was constructed in 1962 and officially opened on August 6, 1966. It was originally named Salazar Bridge (Ponte Salazar) but was renamed in 1974 after the Carnation Revolution. The Fatih Sultan Mehmet bridge, also known as the Second Bosphorus Bridge (in Turkish: Fatih Sultan Mehmet Köprüsü, F.S.M. Köprüsü or 2. Bosphorus Köprüsü), is a bridge in Istanbul, Turkey spanning the Bosphorus strait (Turkish: Bosphorus ). When completed in 1988 it had the 6th longest suspension bridge span in the world; today it is 15th. This amazing bridge is named after the 15th century Ottoman Sultan Mehmed the Conqueror, who took Constantinople (Istanbul) in 1453 and ended the Byzantine Empire. It carries the European route E80, Asian Highway 1 and Otoyol 2 highways. The bridge is situated between European side) and Asian side. It is a gravity-anchored suspension bridge with steel pylons and vertical hangers. The aerodynamic deck is hanging on double vertical steel cables. 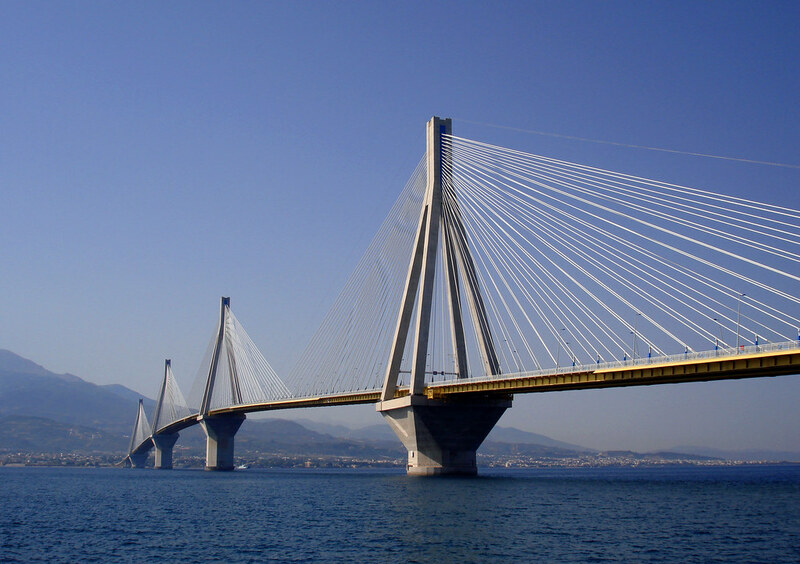 It is 1,510 m long with a deck width of 39 m. The distance between the towers (main span) is 1,090 m and their height over road level is 105 m. The clearance of the bridge from sea level is 64 m.
Officially called Charilaos Trikoupis bridge, Rio-Antirio bridge is the second longest cable-stayed bridge in the world, 2252 m, after Millau Viaduct in France. Constructed from 1998 to 2004 and was four months ahead of schedule. Its 65m foundations are the deepest for a bridge, this was to accommodate for deep water levels and tectonic movements in the area. Tower Bridge (built 1886-1894) is a combined bascule and suspension bridge in London, England, over the River Thames. It is close to the Tower of London, from which it takes its name. It has become an iconic symbol of London. This amazing bridge consists of two towers tied together at the upper level by means of two horizontal walkways, designed to withstand the horizontal forces exerted by the suspended sections of the bridge on the landward sides of the towers. The vertical component of the forces in the suspended sections and the vertical reactions of the two walkways are carried by the two robust towers. The bascule pivots and operating machinery are housed in the base of each tower. The bridge’s present colour scheme dates from 1977, when it was painted red, white and blue for the Queen Elizabeth II’s silver jubilee. Originally it was painted a chocolate brown colour.